Your vacation rental business is fluid. You can’t wait days or even weeks if you need to make a change to your website. Your website is simply the most important place people can go to get information about your business. So, it only makes sense that you should have the power to change the content on your website in real time. In today’s post, we’ll look at the different options available for managing vacation rental websites, and examine the benefits of having an integrated content management system. Option 1: Website Built by Independent Web Design Company (no CMS) – This is a very common situation for many vacation rental managers. Their property management software does not have an integrated website (or the integrated website is sub par), so they work with a third-party web design company to build and manage their website. While the third-party designer can build a custom design, the designer will need to make sure it can integrate properly into your software using an API or an iframe for your property listings and calendars. The problem is that many third-party web designers do not offer a content management system, which means you will need to go through them to make any changes to your website. Every update generally costs you more money, and sometimes you can wait days or even weeks for the changes to be made. Not to mention, third-party designs can cost $5,000 to $10,000 dollars or more. Option 2: Website Built by Independent Web Design Company (third-party CMS) – Some web design companies can build a website for you and attach it to a third-party content management system, like WordPress or Joomla. Some even have built widgets for your properties and your calendars. But, the problem is that you will need to log into two different systems to make changes. Changes to your website content will need to be made through the CMS, and changes to your properties and calendars will need to be made through your property management software. Because the two systems are different entities, they don’t always work together as intuitively as you’d expect. Option 3: Website and CMS as Part of Your Software – One thing that makes LiveRez different is that we design your website for you based on the tested best practices we’ve used in developing high-conversion websites for hundreds of professional managers across the globe, and we also include a content management system within our software. Because our property management software and our websites are part of the same software system, they work together intuitively. You can change most of the content on your website right from the same software that you use to manage your rentals. When you make changes to your properties, your rates, your specials, etc., they are automatically reflected on your website, too. So, with LiveRez, you really get the best of both worlds. You get an optimized website designed to your specifications, an integrated content management system that works intuitively with your management software, and you don’t pay for third-party design services or pay for making simple updates to your website. 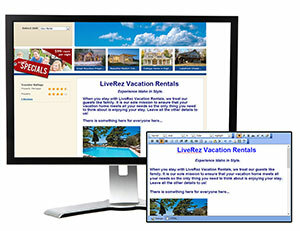 To learn more about LiveRez-powered websites, visit LiveRez.com/websites.